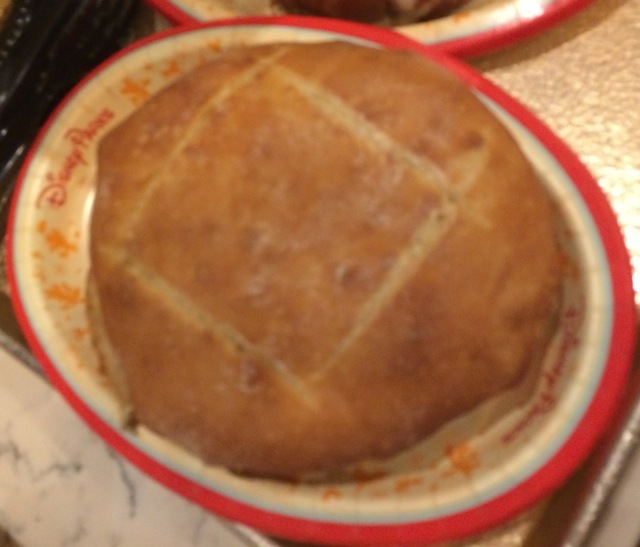 We rarely stop at Les Halle Boulangerie Patissiere in the France Pavilion at Epcot. Not sure why, maybe because pastries and sandwiches aren’t our usual choices for breakfast. However, Nevie hadn’t eaten here yet and when she was a teenager, it was a must-do stop on her visits to Walt Disney World. I ordered the Poulet Au Pistou (chicken sandwich with pesto). The chicken was plentiful enough, but even after “toasting” it was still stone cold and frankly, it was dry! This isn’t going on the do-again list. 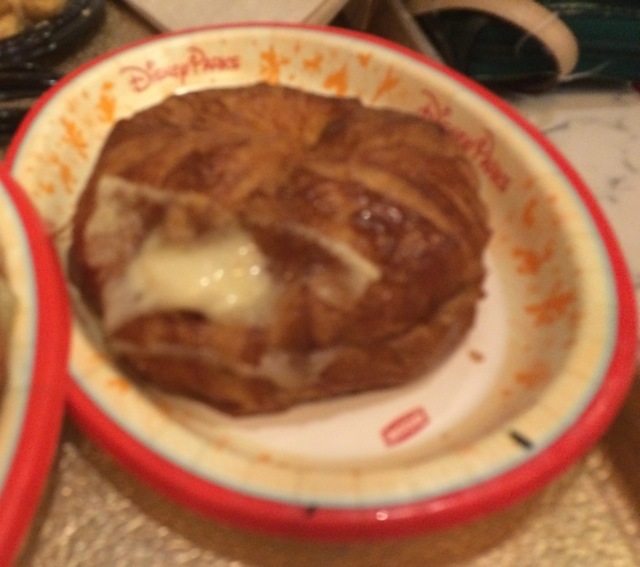 Nevie ordered the Croissant Jambon Formage (ham & cheese croissant) – a long time favorite of hers regardless where she eats breakfast. She said it was quite good. She also ordered a Chaussons Aux Pommes (apple turnover). This looked so pretty in the pastry case. It wasn’t as good as it looked. 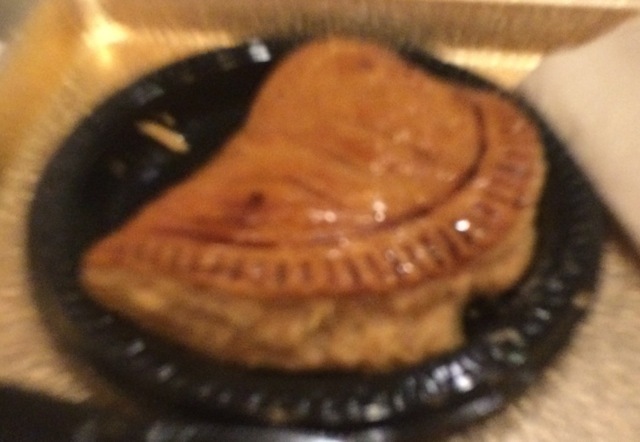 The filling was more akin to apple sauce than to apples and the pasty itself was pretty dull. Not a do again. 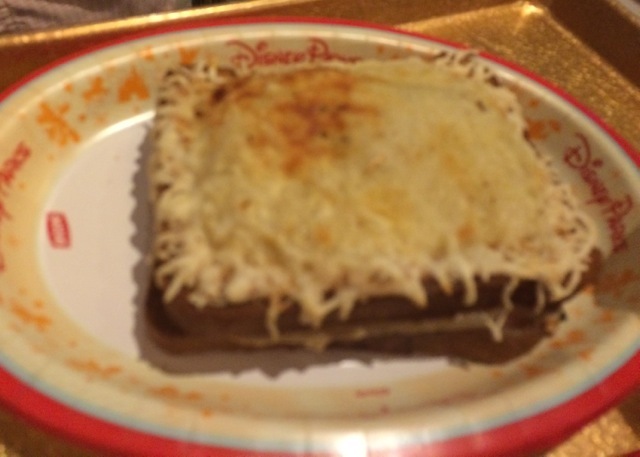 Nick ordered the Croque Monsieur (toasted ham & cheese with béchamel) – I think because Andy always gets these when they have lunch at the restaurants in France (at Epcot). This was actually warmed (we’d asked for all items to be toasted). He gave me half of his and I gave him half of the chicken – it was very nice of him to share but I think he got the raw end of the deal, he should have kept the Croque Monsieur! This was much better than the chicken sandwich and I might order it again. However, the biggest hit of the morning was the most unassuming item, Lard Formage roll. 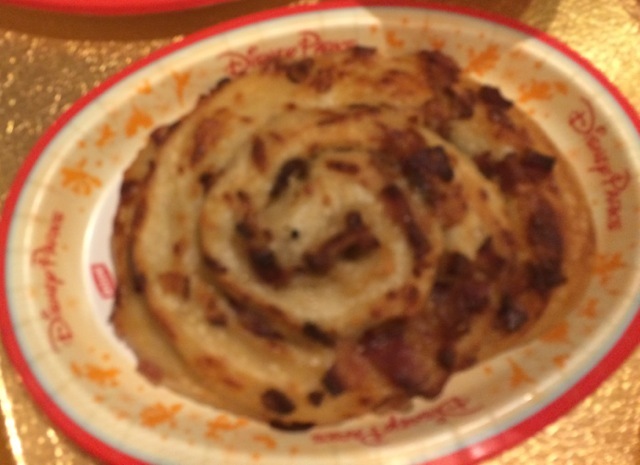 It looks a little like a cinnamon bun. It was loaded with little bits of bacon (“lard”) but it was more like the rasher bacon we’ve had in England and Scotland – very flavorful and not fatty. It was a bit moist and buttery and cheesy in the interior. This is definitely a do-again for Nick and I. Maybe for Nevie too on her next trip to Epcot. What’s up with the photo quality? Too hungry and too rushed. Wasn’t sure it would be a post, but decided what the hey… New and different, so here it is.